Health care personnel help an injured person after being wounded by gunfire from a vehicle in Macerata, Italy, Feb. 3, 2018. Luca Traini, a one-time club bouncer, sometime boxer and far-right electoral candidate, was defiant during a standoff with Italy’s paramilitary police, the Carabinieri, Saturday in a piazza in the small central Italian town of Macerata, 200 kilometers northeast of Rome. 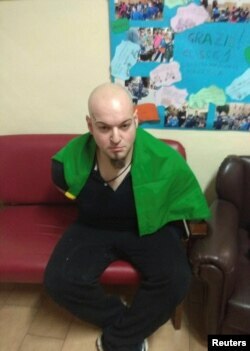 After wounding a half-dozen African immigrants, two seriously, during a two-hour drive-by rampage in the town’s narrow streets, he slowly removed his jacket in front of a war memorial and draped the Italian tricolor flag over his shoulders before giving the Fascist salute and surrendering to police, eye witnesses said. The calmness of his arrest contrasted with the chaos that swept the hilltop town of 43,000 as the 28-year-old scanned the streets Saturday for migrants to shoot. Luca Traini, 28, suspected by the police of opening fire on African migrants, is seen in Macerata, Italy, Feb. 3, 2018. “He drove around in his car and when he saw any colored people he shot them,” said Macerata resident Marcello Mancini. The town’s mayor and local police urged residents to stay off the streets and remain indoors as the drama unfolded. Police say five men and one woman were injured in the attack, which may have been carried out in revenge for the killing in January of a teenage Italian girl, a drug addict. Police suspect a 29-year-old Nigerian migrant, who was taken into custody last week. All of Traini’s victims came from sub-Saharan Africa and are between the ages of 21 and 33, police said. Four were discharged from the hospital after receiving treatment for minor wounds. The two remaining in hospital have serious, but not life-threatening, injuries local officials said. According to police and local media reports, Traini told friends last week at a local gym that he wasn’t afraid to use a pistol he owned. The threat came during locker-room conversations about the discovery of the body of 18-year-old Pamela Mastropietro, found dismembered and stuffed into two suitcases on the outskirts of Macerata. Some local media reports suggest Traini may have known the girl and may have had a romantic obsession for her. Racial tensions in the town have been high since Mastropietro’s murder. Calls for revenge attacks were posted on the Facebook page of the girl’s mother days before Traini’s shooting spree. Italian Prime Minister Paolo Gentiloni told Italians on national television a few hours after the shootings that “hatred and violence will not be able to divide us,” and he urged calm. A man posts symbols of parties that will run in the country's March 4 election at the Ministry of the Interior palace in Rome, Italy, Jan. 19, 2018. But Traini’s racially motivated shooting spree is inflaming Italian national politics a month before an election supercharged with angry exchanges over immigration, which has become the top issue in a bad-tempered election. Italy’s far-right populist parties have been campaigning on anti-immigration platforms. The country’s maverick anti-establishment Five Star Movement, which may emerge from the polls March 4 the largest single party, has been echoing the anti-migrant sentiments of the populist right in recent weeks. Some left-wing politicians accuse their far-right opponents of shaping the circumstances for the shooting, arguing that charged anti-migrant rhetoric risks prompting violence. Within hours of Saturday’s shootings, the leader of Forza Nuova, a neo-fascist party, offered to pay Traini’s legal bills and said the shooter’s actions were understandable. Traini, who was a regional candidate for the far-right Northern League in local polls last year, was formerly a member of Forza Nuova. On the right side of his forehead, he sports the party’s symbol, the Wolfsangel rune, the insignia of Adolf Hitler’s 2nd SS Panzer Division known as Das Reich. More than 600,000 migrants, mostly sub-Saharan Africans, have entered Italy illegally by sea, mainly setting off from war-torn Libya, in the last four years, straining the cash-strapped country’s resources. Matteo Salvini, the head of the Northern League, a partner in a right-wing electoral alliance overseen by former Italian Prime Minister Silvio Berlusconi, condemned the shooting but laid the blame for it on Italy’s “open migration policy,” which he says has fueled racial tensions. Salvini has been campaigning for the expulsion of migrants and says any coalition government he joins will need to expel at least 100,000 in its first year in power. Opinion polls suggest that Berlusconi’s right-wing alliance, including the Northern League, Forza Italia and the Brothers of Italy, will likely win the largest bloc of parliamentary seats but not enough to form a working majority.